Wow! This suit is fantastic! 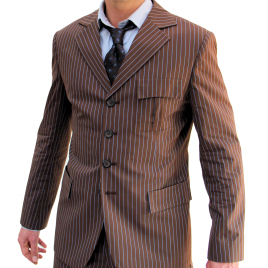 I ordered it on October 1st as a last minute impulse to be the doctor for Halloween. I was worried about it getting to me in time but it got here this afternoon. FLOORED!! The details if this piece are immaculate and the fit! This is the best fitting suit I've ever owned and I'll certainly be wearing it out besides the 31st. The blue suit is an eye catcher by all means! Hats off to Indy and his talented team if tailors for this masterpiece, will be ordering from them again!